First Line: The coffin is definitely a health and safety hazard. The coffin in question belongs to a medieval bishop named Augustine who is dug up when the site of his burial is scheduled to be turned into a huge grocery store. Despite all the warnings Augustine gave about leaving his remains alone, a small "unveiling" is scheduled in the Smith Museum, presently owned by one of Augustine's descendants. Forensic archaeologist Dr. Ruth Galloway has been asked to preside over the opening of the coffin, but when she shows up at the museum a little early, she finds the curator dead on the floor by the bishop's remains. Ruth's daughter Kate has just turned one, and Ruth feels as though she's slowly getting the hang of being a mother, even if Kate lets her get very little sleep. She'd like to be more interested in the curator's death, but the coroner labels it natural causes, and Ruth moves on to the next items in her busy agenda. Bishop Augustine's unveiling is done very quietly, which is a good thing because something totally unexpected occurs. Augustine's descendant, Lord Smith, shows Ruth a room full of Aboriginal bones another ancestor harvested and brought back to England from Australia. A group called the Elginists is demanding that the bones be repatriated to their homeland, but Lord Smith views them as his rightful possessions and refuses. Shortly thereafter Lord Smith dies-- also of natural causes?-- and Detective Chief Inspector Harry Nelson is brought in to investigate. 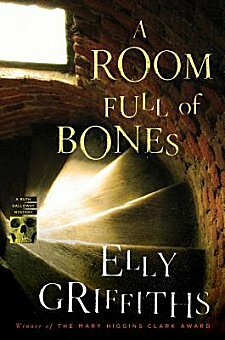 Having been searching for drug smugglers, Nelson isn't convinced that these deaths are natural, especially when threatening letters to both victims turn up, but when he's hospitalized with a mysterious and deadly fever, his team have to take up the slack and try to find out how a medieval bishop, Aboriginal bones and drug smuggling all tie in together. Although part of a series, this book can easily be read as a standalone because Griffiths fills in many details from the previous books (sometimes to the detriment of earlier plot points). The story here is a good one, with several elements that I didn't deduce before the author showed me how they fit together. If you're the type of reader who demands that favorite characters remain front and center in each book of a series, you're going to be a bit disappointed in this one. Although there is much about Ruth and Harry's ever-evolving relationship, they are often at the periphery of the investigation. Although I did miss them, this allows Griffiths to let her secondary characters stretch their wings a bit and provide many exciting scenes. Two things really excited me about this book. One was the plot. I love stories with strong elements of superstition and legend in them that can be explained by something concrete and almost commonplace. Not only does it give my brain a workout, this sort of plot does the same for the characters in showing how they react to it and investigate it. Griffiths' plot moved like a well-oiled machine, and I found myself reading faster and faster in an attempt to gather it all in and find a solution before the characters did. The second thing that excited me was Griffiths' cast of characters. The cast is growing and developing strong new faces, which bodes well for the future of the series. The relationship between Ruth and Harry with its awkwardness and misunderstandings, the way Ruth is adapting to motherhood and the appearance of another man in her life, the way Harry and his wife are trying to hold things together... all these elements are constantly evolving as they would in the real world. In this book I was reminded time and again of my favorite "relationship" series written by Deborah Crombie. To have this series join the ranks of those in which the characters attain such a level of verisimilitude is very exciting stuff indeed. Oh, I'm glad you liked this book, I just ordered it and I was hoping it would be good! I liked her other books, too. Have you read "Criminal" by Karin Slaughter, yet? I can't put it down. I'm afraid that I have yet to read any of Karin Slaughter's books. This is the second time in two days that someone's mentioned this author, so I know I have to put her name on my wish list! I love this series..and this was a good one. Oh goodness, I must see if the library has this one yet. It sounds fantastic. I've loved them all so far. Aaagh! This is the second review I've seen of this today! I didn't think it was coming out until next week. I can't wait to read it. Glad it was such a good one. I've seen the second review of this book as well. Glad you liked it so much. I'm going to have to track down this other review just out of curiosity! I haven't started CRIMINAL by Karin Slaughter yet, but I will soon. I love her books as well. Cathy - Oh this is a terrific series and I'm so glad you liked this one! You make an interesting point too about how nice it can sometimes be when secondary characters get the chance to shine just a bit. I also like Griffiths' innovation; her plots never seem "same-y" to me. I love to find one of your A+ ratings! This sounds like my kind of book...just a bit leery as it is a series!